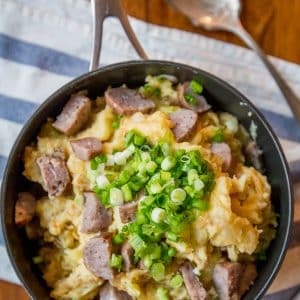 The Best Pan Fried Cabbage and Sausage Recipe Ever is the perfect easy way to celebrate Saint Patricks Day with a one pot cabbage and sausage dinner skillet that is low carb and keto diet compatible, family tested and approved, and goes from the fridge to the table in under 20 minutes in just one pot! Cabbage is one of those things a lot of people are a bit skeptical to try – it’s rich, delicious, buttery – and cooks quickly without much fuss – but because it can be bitter and boring when not cooked down, a lot of people turn their noses to using cabbage as a major part of a dish. 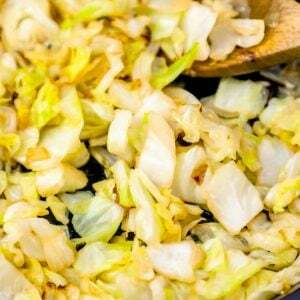 Cabbage is something people usually only think of when it’s around Saint Patricks Day when it is hugely popular in America as an homage to Irish cuisine – or as a garnish in tacos, salads, and more. In this easy one pot sausage and cabbage skillet, it takes on a perfect rich and meaty flavor your whole family will love! 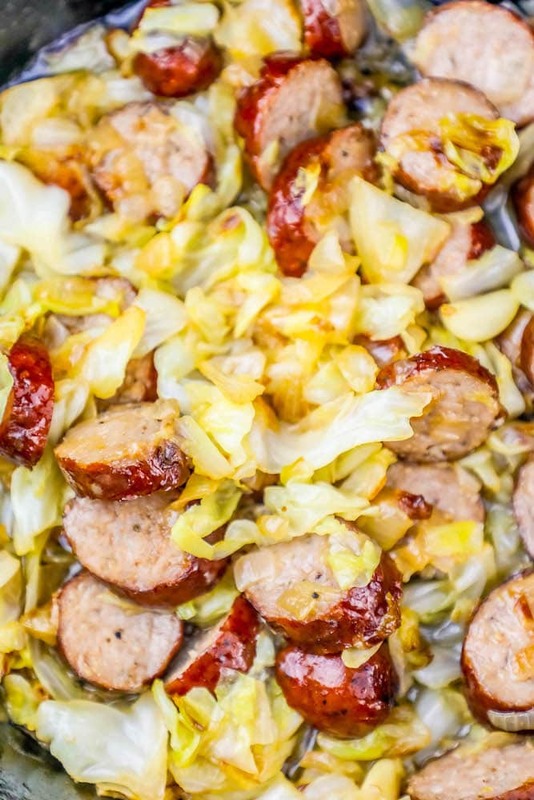 The Best Pan Fried Cabbage and Sausage Recipe is super easy and can go from your fridge to the dinner table in just one pot and under 30 minutes – making it a delicious, hearty, and family friendly dinner that you’ll want to eat long after Saint Patricks Day when you’re thinking of easy Irish Recipes. 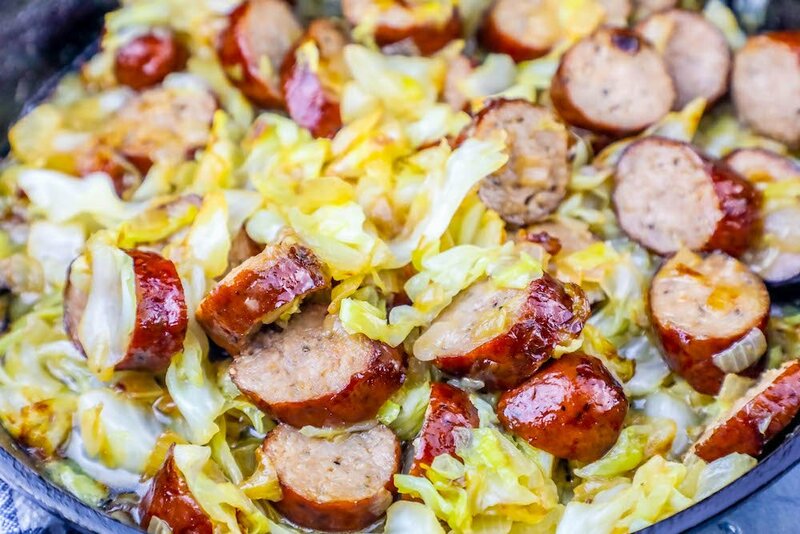 I love to cook cabbage and sausages when we’re in a pinch and need something quick for dinner – or as a swap for heavier, greasier comfort foods since it still tastes nice and indulgent! 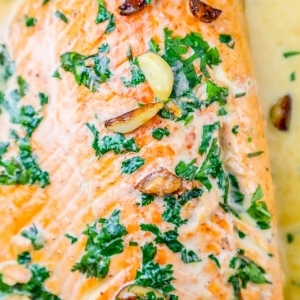 This is one of my top keto dinner swaps for quick meals like macaroni and cheese or pasta… my husband has lost over 50 pounds since starting keto a couple of months ago, and while I still have a gigantic amount of weight to lose, the high fat and low carbohydrate diet has helped me have so much more energy and less pain from Rheumatoid Arthritis. Fear not, friends, because it’s actually really, incredibly easy to make caramelized cabbage that isn’t bitter, bland or boring. 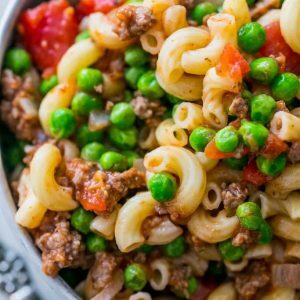 When paired with sausage, this dish is incredibly filling and meaty – and works perfectly in a keto diet so you can enjoy a delicious Irish dinner for Saint Patricks Day without messing up your macros! 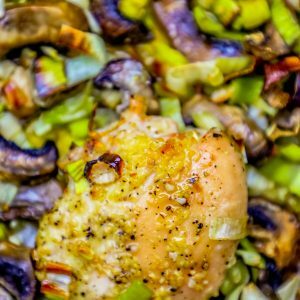 This dinner is full of natural fats, protein, and is low carb – cabbage is good for keto since it is a naturally low carb vegetable! If you’ve ever wondered is cabbage good for a keto diet – you’re in luck, because with around 2 carbs a serving, it most definitely is! Before I get a bunch of comments and questions – no, Polska Kielbasa is definitely not an Irish ingredient since it’s a traditionally Polish sausage. 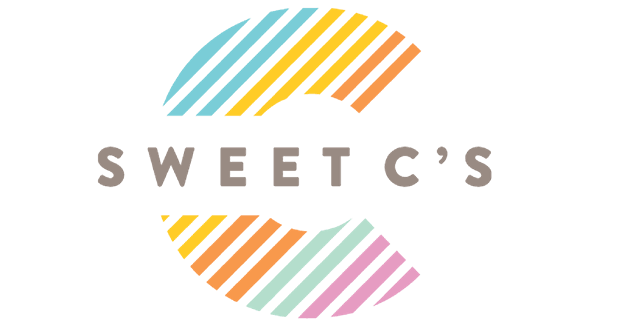 I love the smoked flavor of it though – it works perfectly with cabbage, and an easy ingredient to find pretty much anywhere in America (as pork, beef, turkey, and chicken sausage, too!) unlike a lot of more traditional Irish sausages. I also prefer using smoked sausages since you just need to reheat them to cook them, making this recipe fast and delicious! Cheddar Stuffed Bratwurst, sliced thin, for a cheesy twist on this dish. Andoille Sausage, sliced into thin rounds, for a slightly spicy twist! Cabbage is extremely good for you, and something I try to incorporate more into our diets. 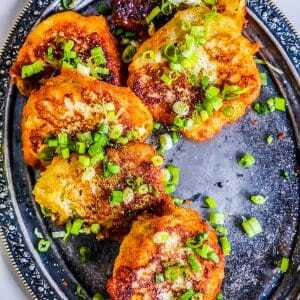 I really love the rich and buttery flavor of cabbage when it’s cooked – and it is a great vegetable to get kids into, since when cooked it has a subtle flavor kids love. 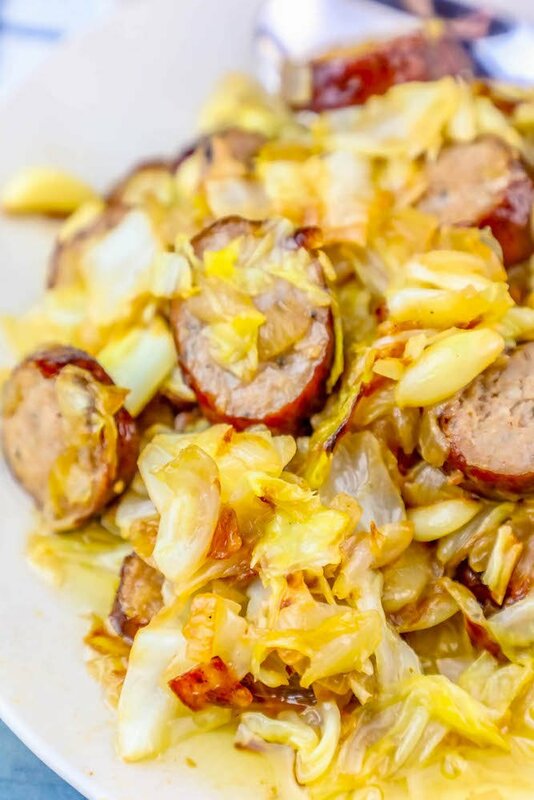 If you’re worried about the nutritional profile of adding smoked Polska Kielbasa (my personal pick for this dish), you can easily swap chicken, turkey, and even meat-free sausages to make The Best Pan Fried Cabbage and Sausage ever! 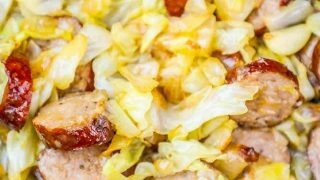 If you love this deliciously easy cabbage and sausage skillet, you’re going to love some of my other favorite Irish inspired meals! 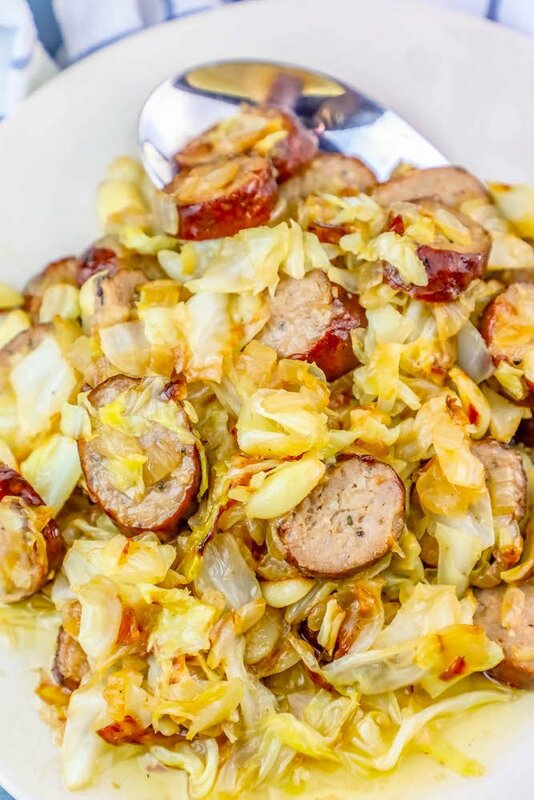 If you love this The Best Pan Fried Cabbage and Sausage Recipe as much as I do, please write a five star review in the comment section below (or on Pinterest with the “tried it” button – you can now add pictures into reviews, too! ), and be sure to help me share on facebook! Slice smoked polska kielbasa into thin rounds and add to pan with cabbage and onions. When cabbage has lost much of it's volume and started to turn shiny, slightly translucent, and has lovely browned bits - and polska kielbasa has browned slightly (smoked kielbasa has been cooked already, so you're just adding some browning and flavor to it), it is ready to serve. I made this tonight for dinner bc I was too late trying to buy corned beef. It is delicious! I added salt, pepper, garlic, Adobe, Kielbasa, and arugula to the cabbage! Thank you! I used this (very excellent) recipe as a base and then made my tweaks: (1) I used 2 Tbls. Butter (unsalted) and 1 Tbls. Coconut Oil to saute the vegetables; (2) I added 1/2 pint of halved grape tomatoes (more for color than anything else) at the same time as I added the Sausage; (3) I added a “shake” of Red Pepper Flakes and a “shake” of Smoked Paprika when I added 1/2 cup Heavy Cream (approx. 1 minute before I shut off the heat) and incorporated it all into the liquid that had already formed to make a nice sauce. I served it with Keto Biscuits (which are made with Almond Flour); https://www.dietdoctor.com/recipes/biscuits-and-gravy). For dessert, I served Rasberries with homemade Whipped Cream (sweetened with Splenda) on the side. Everything Keto. By my totally unofficial calculations: 9g carbs per serving (so I probably had 12-14 lol). A very satisfying meal if I do say so myself. Supper good! New to Keto and looking for yummy recipes. Found a favorite. Thank you, this was delicious! Wonderful! Made with a dozen mild Italian sausages, used up a couple of kohlrabi cuz I didn’t have enuf cabbage, added a dash of caraway seeds at the end, super delish!